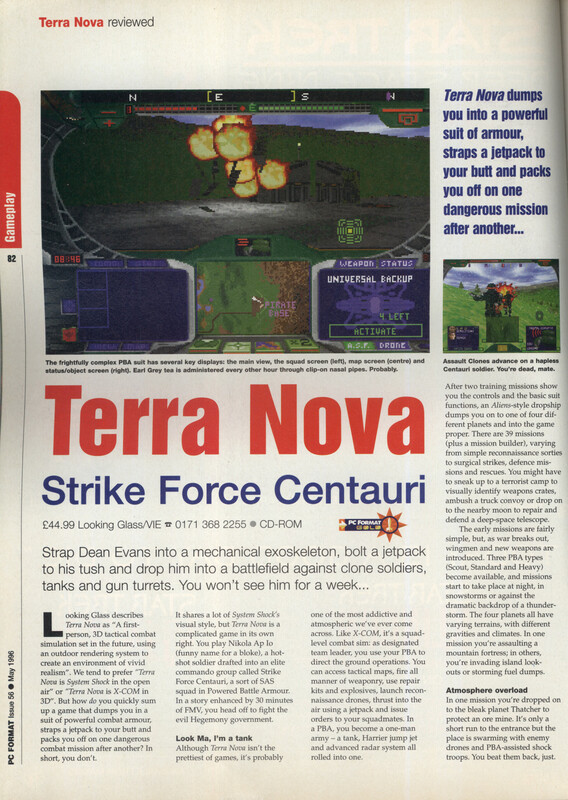 While Wing Commander 4 was getting pummelled by the British press, Terra Nova appears to have been universally praised. It’s curious when they strike me as being similar in so many ways. 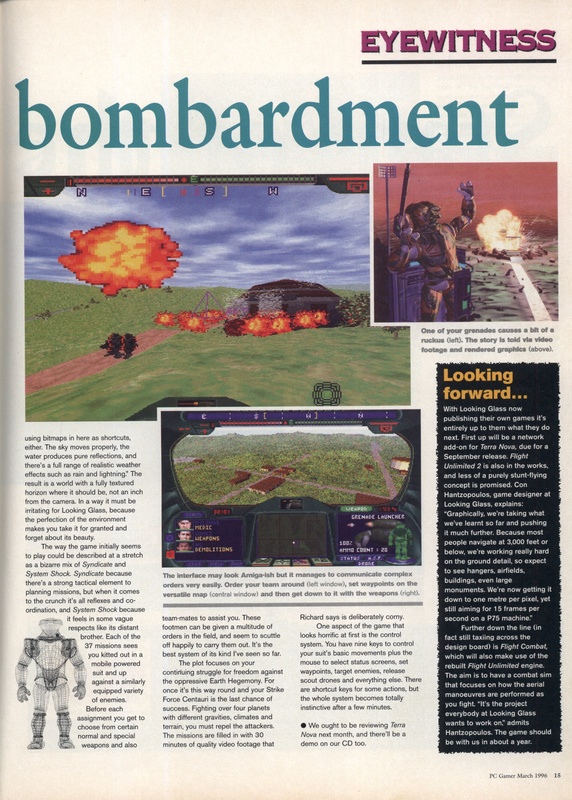 I’m shocked to read this from a Wing Commander fan of the time. It sounds like one of his problems is that his PC isn’t fast enough to play the game properly. 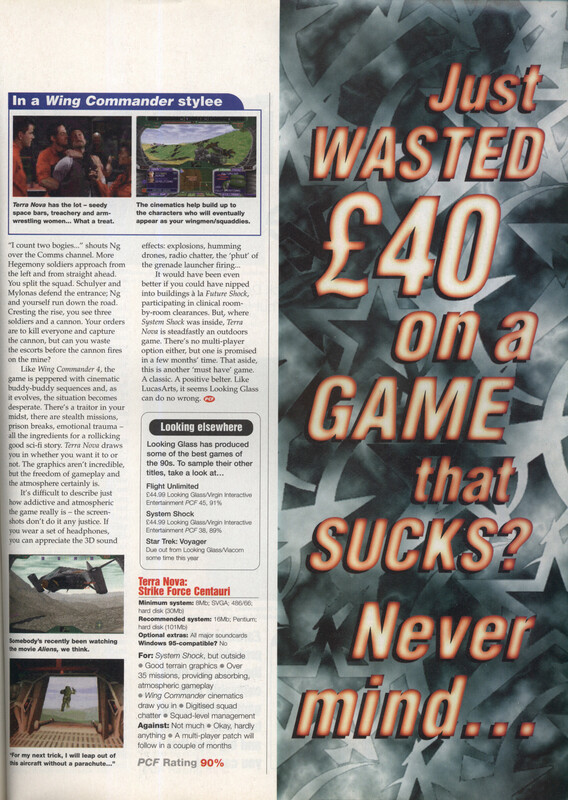 I do think Origin suffered to a degree in the UK because of this. 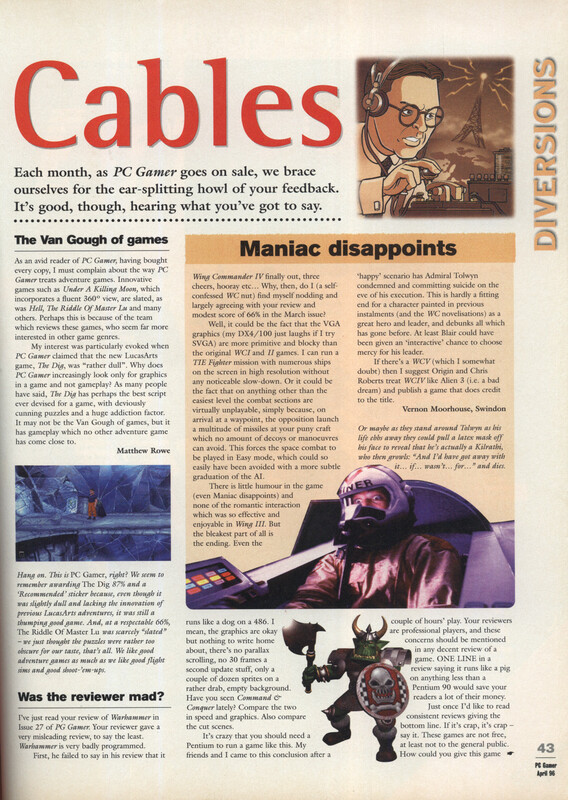 PC’s over here were way more expensive than in the USA and the average spec suffered as a consequence. On the other hand, how anyone can prefer the WC3 movies and story to WC4 is beyond me. 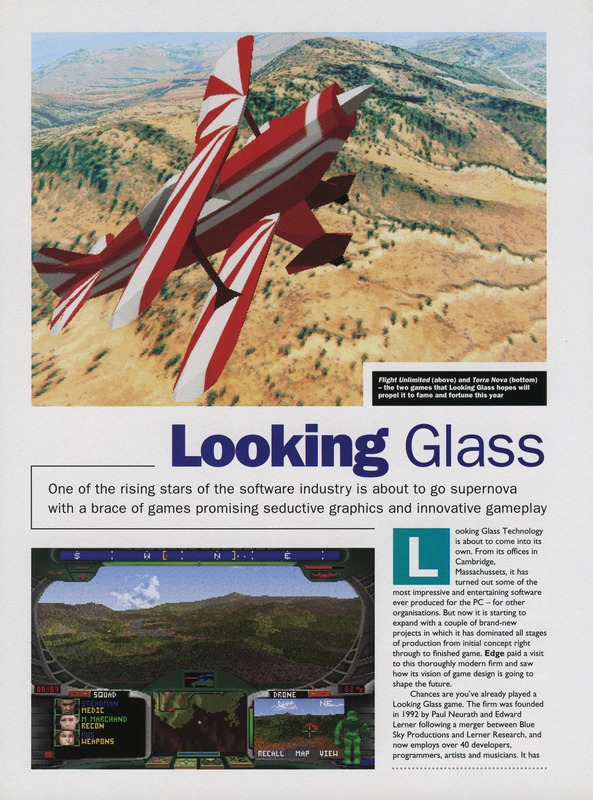 Having got the VFX-1 working, I thought I’d do a playthrough of each of the 3 supported Origin/Looking Glass games that I’ve already looked at. They are all games that I’d only played the once and wouldn’t have been adverse to trying a second time without the added intrigue of VR. Before I get to Terra Nova, a quick run through on the hardware. 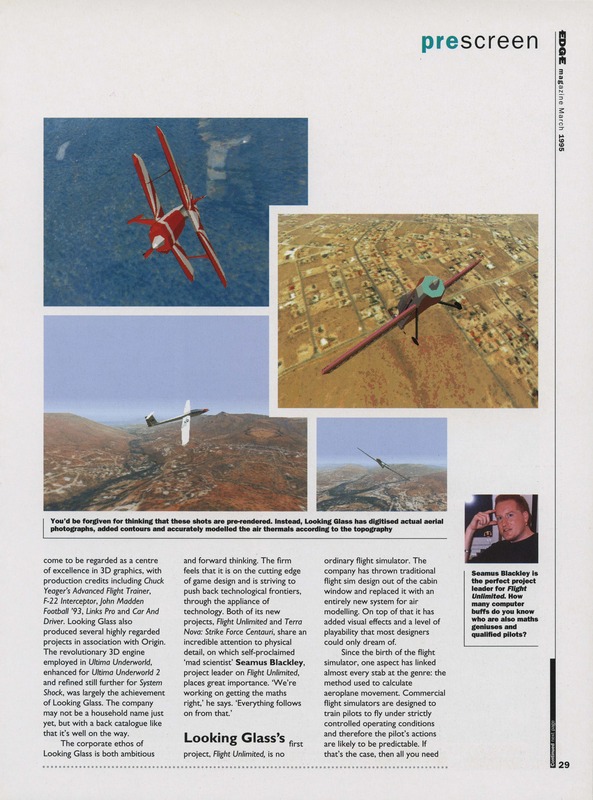 The Forte VFX-1 was first sold in 1995 around the height of the brief VR bubble. It was arguably the leading home use product of the time although there were plenty of alternatives. While hardly cheap to pick up these days, it sold for $1,000 at the time putting it way beyond the means of most of us. The headset is surprisingly lightweight at 1.1 kg and despite its age is still a great looking bit of tech (at least when not being worn). Whether you would want to let anyone see you using it is another matter. It comes with an ISA card which connects to your graphics card via a VESA cable. The VESA interface restricts the headset to 256 colours although I’ve heard that the displays can cope with more than this. A prototype adapter was built by Forte which took the signal directly from any graphics card’s VGA output although I understand this still relied on the ISA card for head tracking. 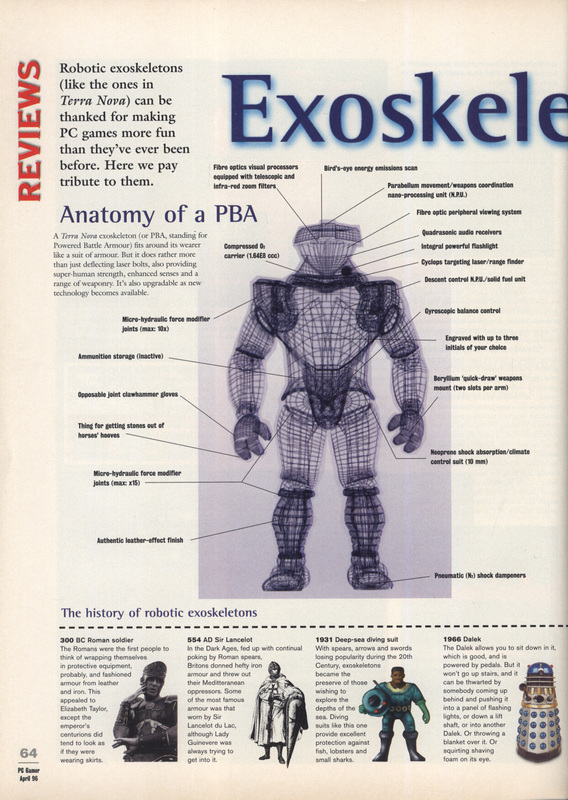 There is an electronic schema available on the internet to build your own but the cost would be prohibitive with other alternatives available for modern games. Aside from limiting the palette, the VESA connection means that the VFX-1 is extremely picky as to which graphics cards it will work from. I had to find a 1996 FAQ with a list of supported cards and then track down one of the few I could find on Ebay. Many of the cards on the list are VLB or ISA cards which didn’t leave a huge selection. 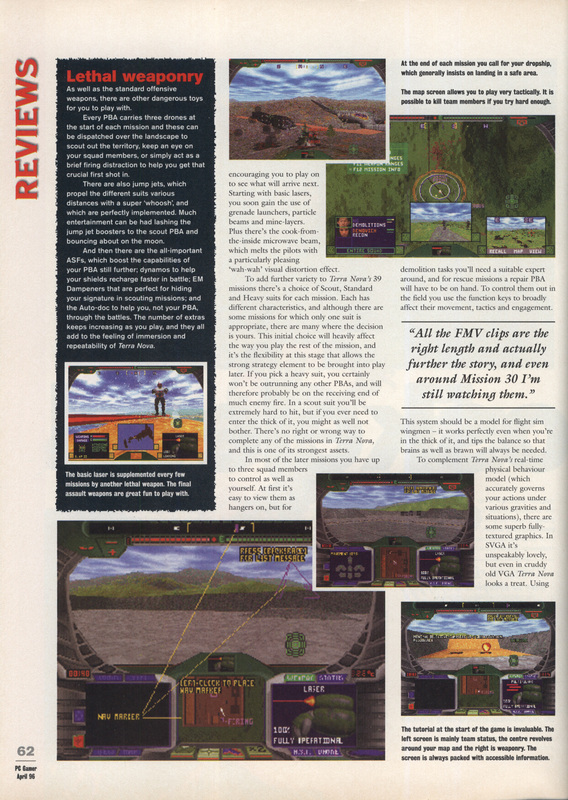 The time the VFX-1 was being sold coincided with the move toward 16-bit games and early 3dfx cards none of which worked with the VFX-1 with the exception of the Voodoo Rush. This lack of compatibility, combined with the price must have been a major hindrance to uptake and certainly killed the longevity of the product. The helmet connects to the ISA card via a 26 pin RS232 cable into the back of the headset. Aside from the video, this cable carries the power (surprisingly drawn directly from the ISA bus) and the audio for the built-in headphones. 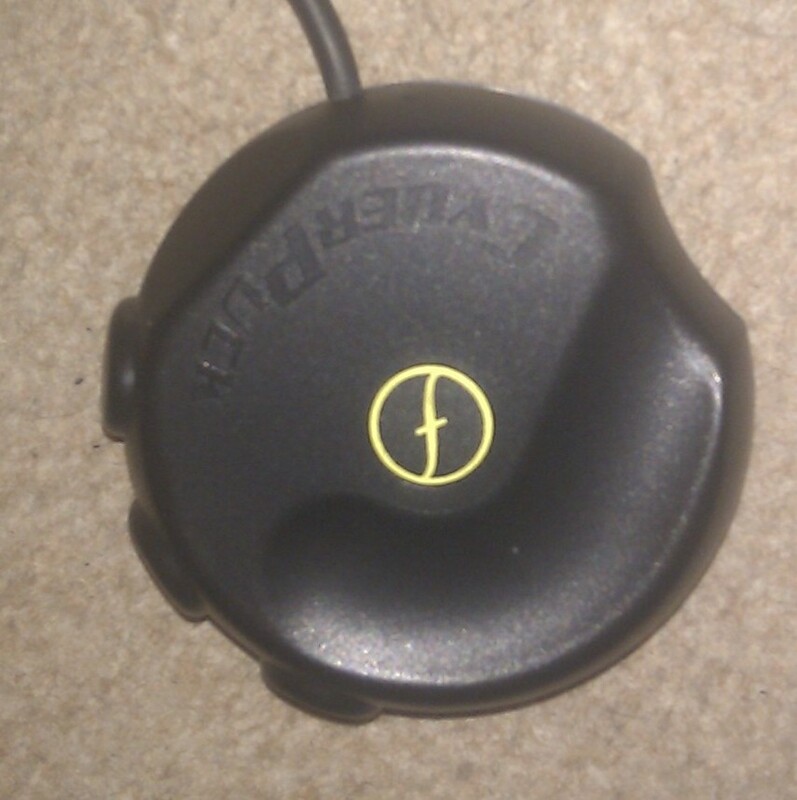 A second connector is built into the helmet for the included Cyberpuck controller. 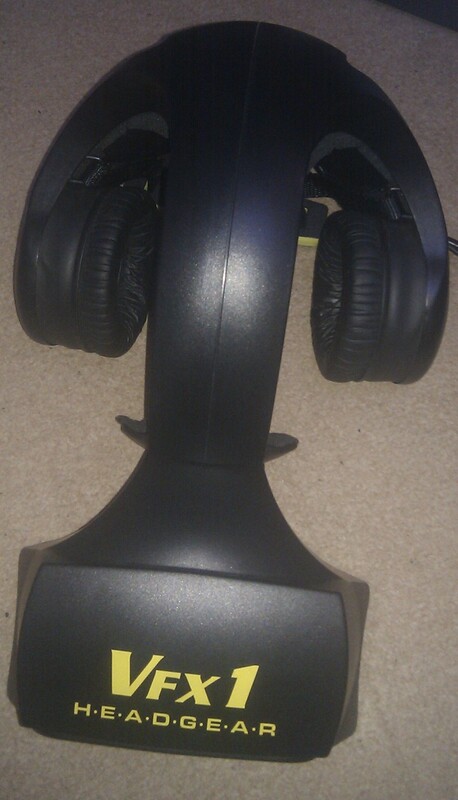 The built-in headphones are sizable and have a bellows style arrangement to accommodate different head sizes. 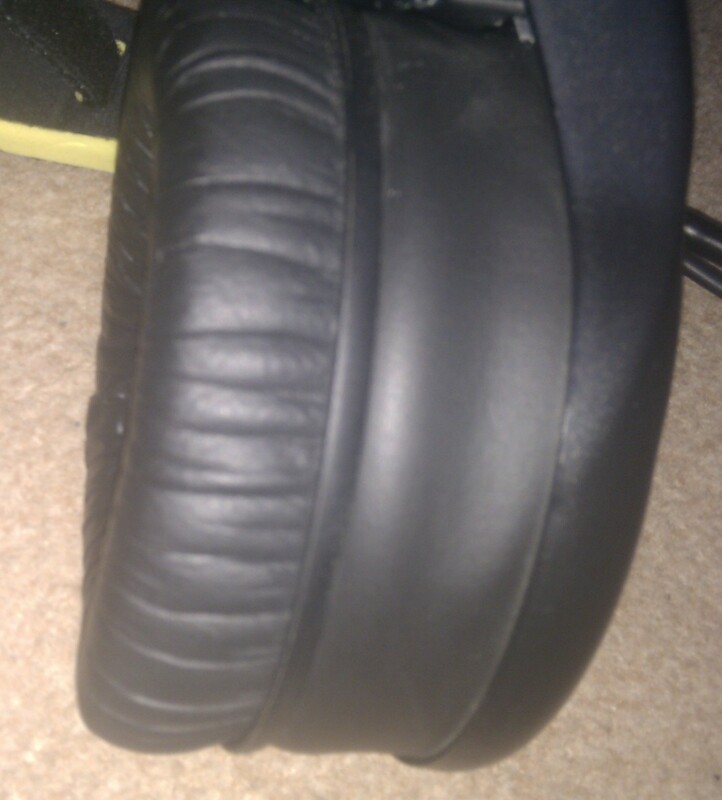 This means they form a tight seal from the outside world and while they aren’t up to the quality on my usual Sennheiser’s they still sound fairly good after all these years. 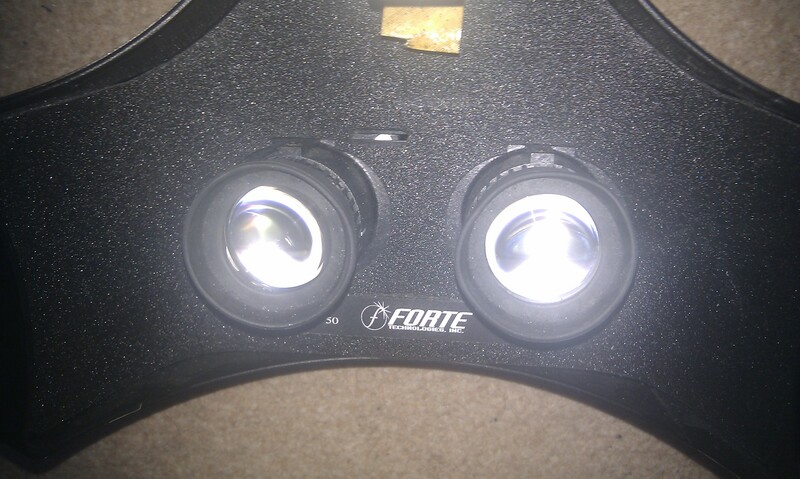 The two eyepieces at the front are on a liftable visor, allowing return to the real world without removal of the helmet. They are independently adjustable left and right and can be twisted to focus. Getting this set up right is tricky as your eyes will compensate for focus to a large extent. 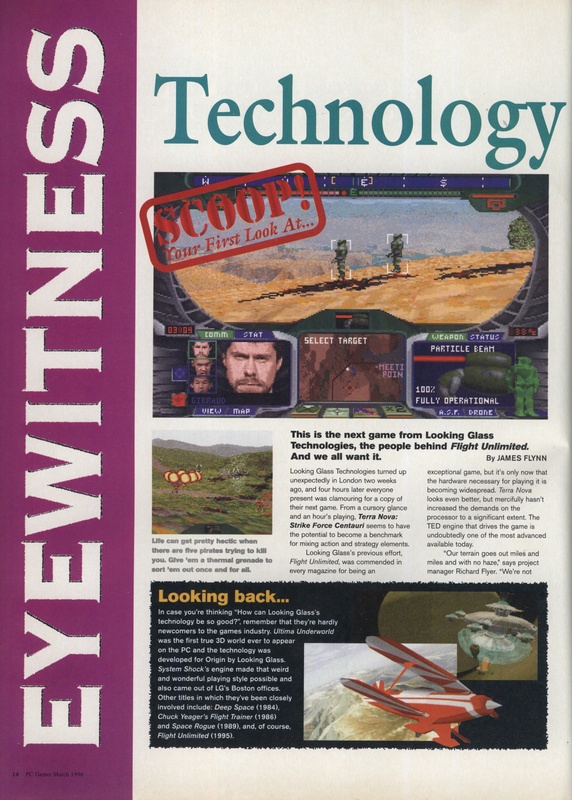 With the visor down, the ideal position seems to be to get the lenses as close to the eyes as possible. The edges of the covers dig in a little when doing this leaving telltale grooves above your eyes after use. The picture through the lenses is fairly clear although I rarely manage to get it 100% focused across the entire image. The field of view is a mammoth 45 degrees making it hard to take in the whole thing in one go. I wouldn’t say using this feels like reality as such and is more along the lines of having an extremely low res cinema screen strapped to your face. It’s also apparent that I’m looking through lenses as the light tends to catch around the edge of the eyepieces giving the impression of looking through a porthole. I’ve found getting the two images in each eye to come together into one image is often quite tricky. Once done it’s fine but it does appear to require focusing your eyes at some point behind the screen which I find quite unnatural. A lot of blinking and large moving 3D landscapes help me out here, but if I just have to focus on something flat in 2D I often can’t do it at all. The resolution of the two LCD’s is slightly odd at 789×230. This means that no matter what resolution you play a game at, it needs to be scaled by the hardware which doesn’t help the image quality. 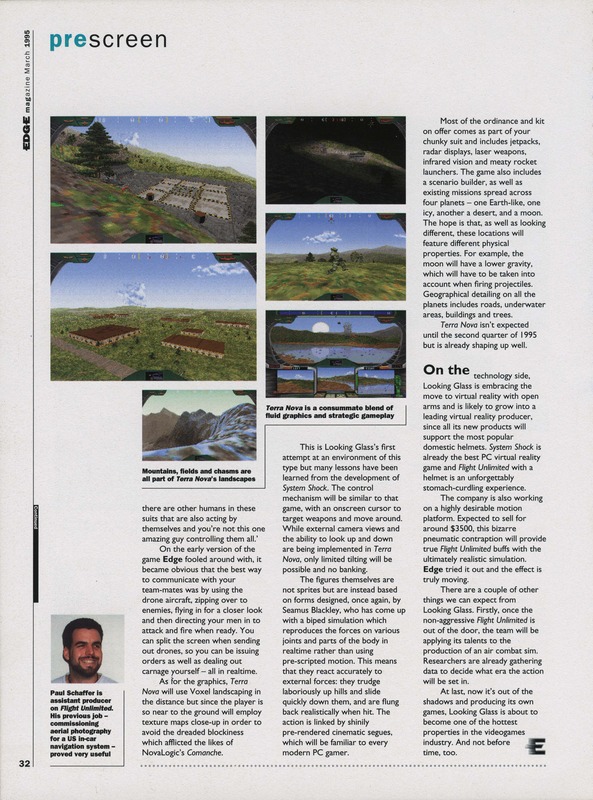 It’s also way short of the required pixels for 640×480 making small text difficult to read. Whether this is an issue depends on the game you are playing. Each dot in the image is clearly visible in a honeycomb pattern, as can just about be made out in my attempt to take a photo through the lens. 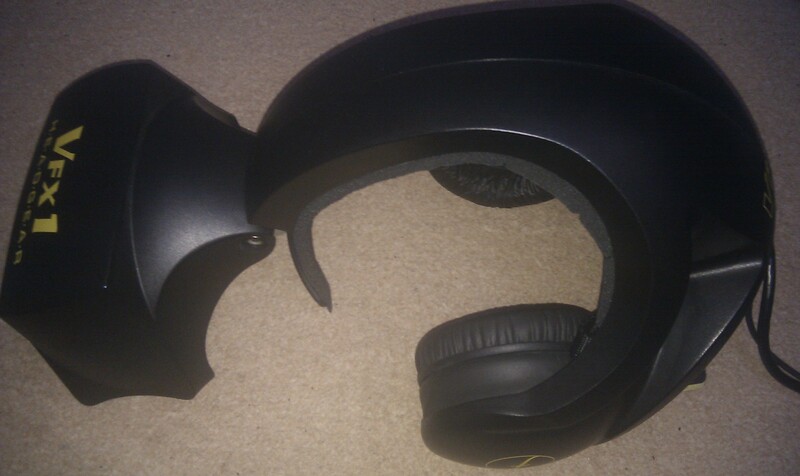 The system came with a serial bus interface built into the helmet allowing for hot-swappable hardware. The interface is a precursor to USB although it was barely used outside of the VFX-1 itself. According to a promotional video, the initial intention for Forte was to release dozens of extra bits of hardware to improve on the experience but I can only speculate as to what they were. The only hardware which ever used this was the Cyberpuck controller which came with the VFX-1. The Cyperpuck is a 3 button mouse replacement which detects its pitch, yaw and roll over a 180 plane in all directions. I’ve not tried to make extensive use of this yet as I’m not entirely convinced by it. I can see the idea of not being confined to sitting at a desk while using the helmet but the included cable attached to the helmet is barely long enough to achieve even that so I can hardly go walking around with it on. Extension cables were available at the time but finding one now could prove extremely tricky. In its favour, use of the cyberpuck is intuitive and works well enough in games not requiring more than basic controls. It is not all that precise however. I’m something of a Quake veteran but you wouldn’t know it when I try to play it with the Cyberpuck and accuracy suffers badly. I daresay I would improve with practice but I stuck solely to mouse and keyboard when playing Terra Nova. 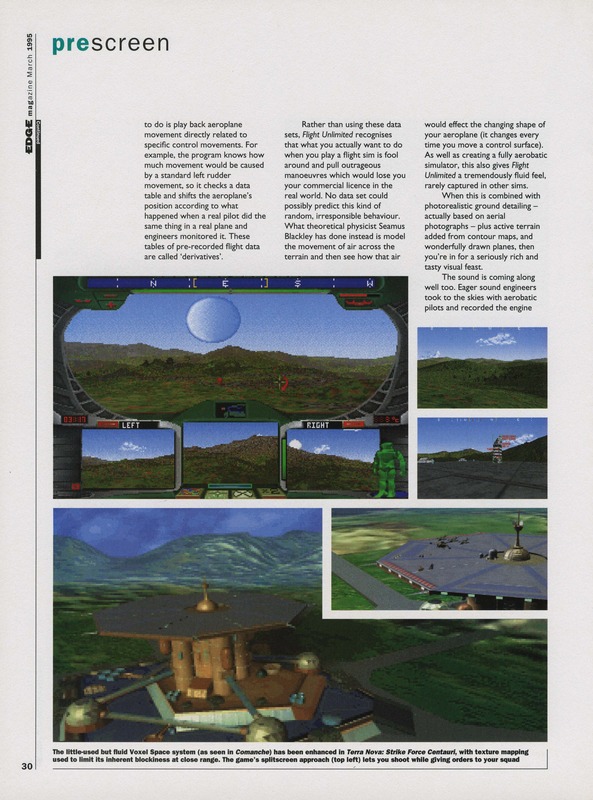 Terra Nova shipped with built-in VFX-1 support for head tracking and the Cyberpuck which is turned on using command line options when starting the game. 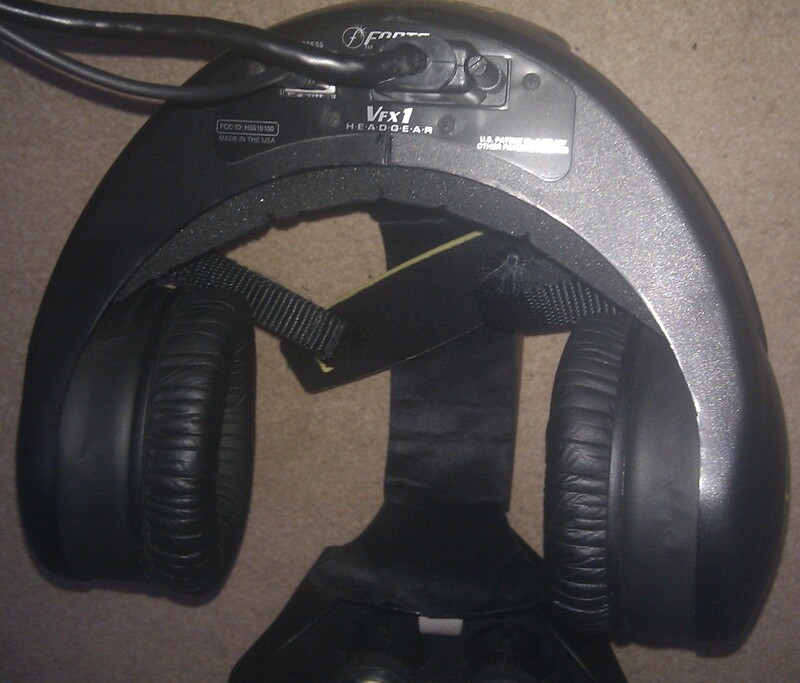 There are two modes for the head tracking. One uses an independent neck so you carry on walking straight on when you look around. The other mode steers when you look. I went for the flexible neck option. I’m sorry to say that there isn’t any stereo-3D support. The first thing to note when playing this on the VFX-1 is that since all the menus are in SVGA, they aren’t all that usable through the headset. Throughout my playthrough, I only ever used it during the missions and flipped up the visor as soon as they were over to watch any FMV and read news/email. 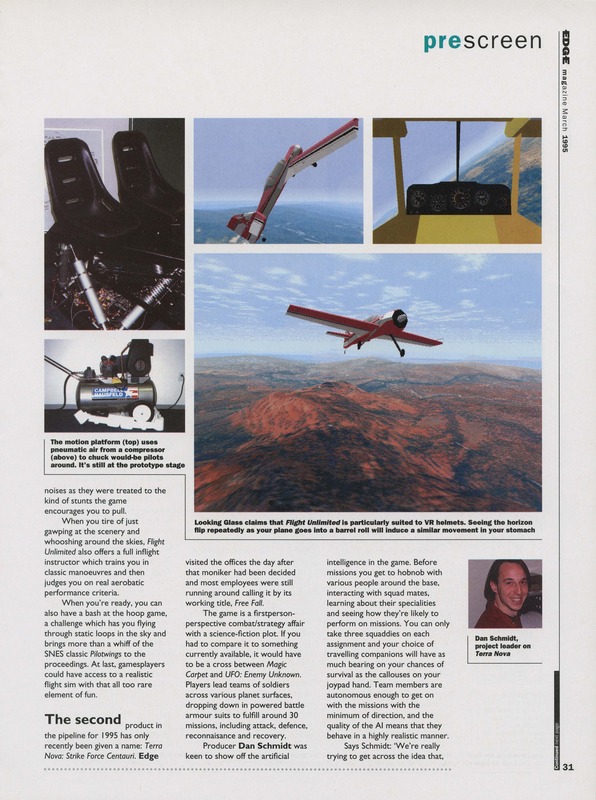 Having the head tracking is an interesting experience but not entirely natural for numerous reasons. First off swinging your whole head while looking straight ahead isn’t quite how you would do things in real life. Combined with years of monitors not following me around the room, it’s far more natural to keep staring straight ahead while playing the game and look using the usual keyboard controls. I started to look around more as I got further but it’s breaking a habit generated by years of gaming. Also the all too short cable and extra head weight make swinging your head around considerably more effort than it would be normally. The helmet is hardly going to give you neck ache or anything like that but it does have a certain momentum to it. Where head tracking does come into its own is looking up and down which for no obvious reason comes more naturally than side to side. It’s a big advantage when drones attack to be able to look in the air and scan around for them. 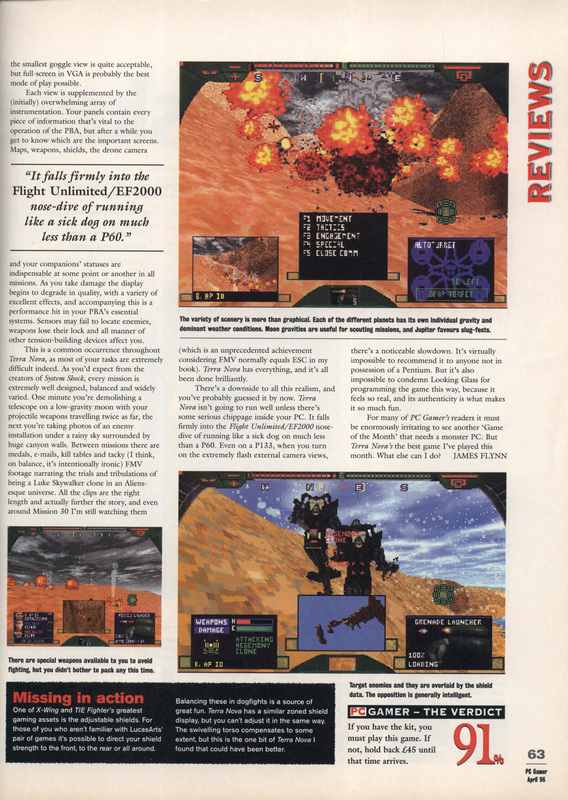 The tracking on the VFX-1 is excellent and way better than the VR-920 I tried some years back which lost its center constantly and needed frequent recalibration. Using one of those was a recipe for serious nechache when you ended up having to look backwards to see ahead of you. I found that the colours tended to merge together on some of the levels and it didn’t make for the clearest view of the world. The games 320×400 graphics mode doesn’t suit the hardware especially well either with most of the extra resolution wasted. With the low resolution and super-sized view, I was almost too close to the action to see it clearly and battles could be a little confused in terms of telling who I was firing at and locating where the cursor was on the screen. The hardware cable comes with warnings not to use for more than 15 minutes at a time, which I of course took no notice of. I can’t say I’ve suffered any ill effects so far and it’s quite comfortable to use on the whole. The bit that feels strange is that a central piece of the helmet comes right down over your forehead applying a reasonable amount of pressure when the visor is up. Having played the whole game, the VFX-1 is probably is the best way to experience it but it both adds and detracts. 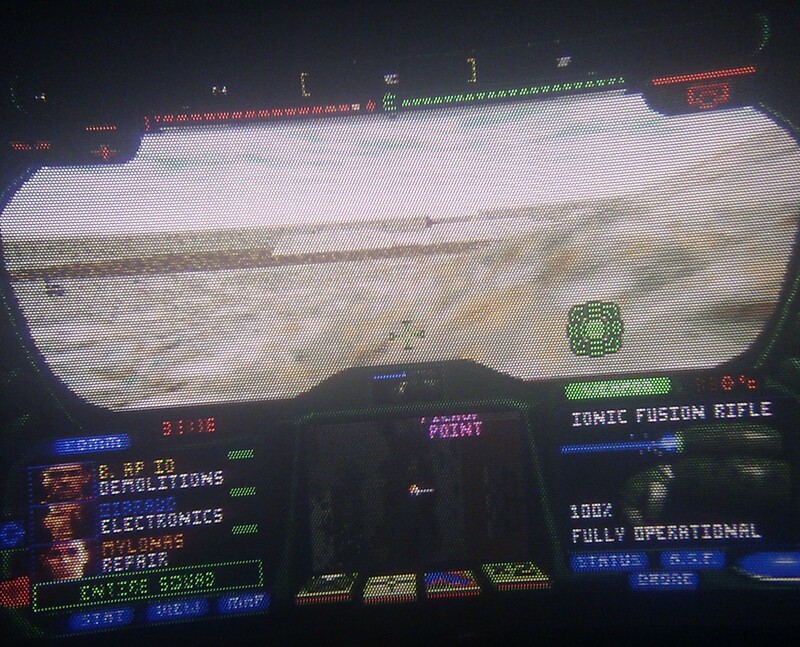 The colour palette didn’t always suit the VFX-1’s LCD screens and the view wasn’t as clear as I would have liked. 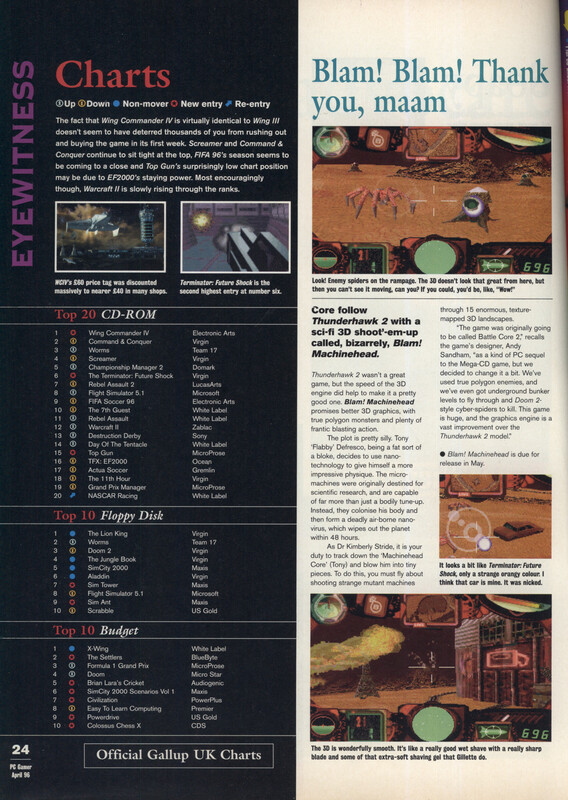 I certainly enjoyed myself but I’ve been more impressed with my experiences on some of the other titles I’ve tried. 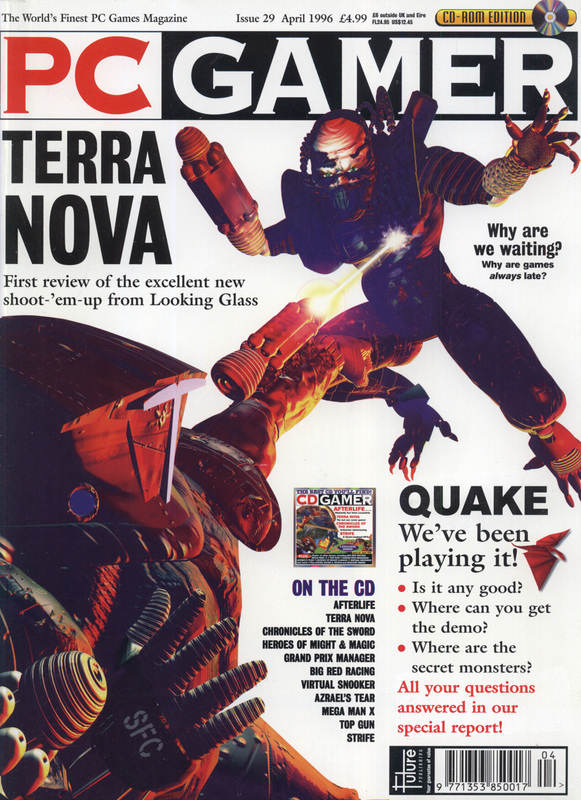 I think my opinion of Terra Nova remains the same after the second playthrough. It’s fun but could have been so much better. 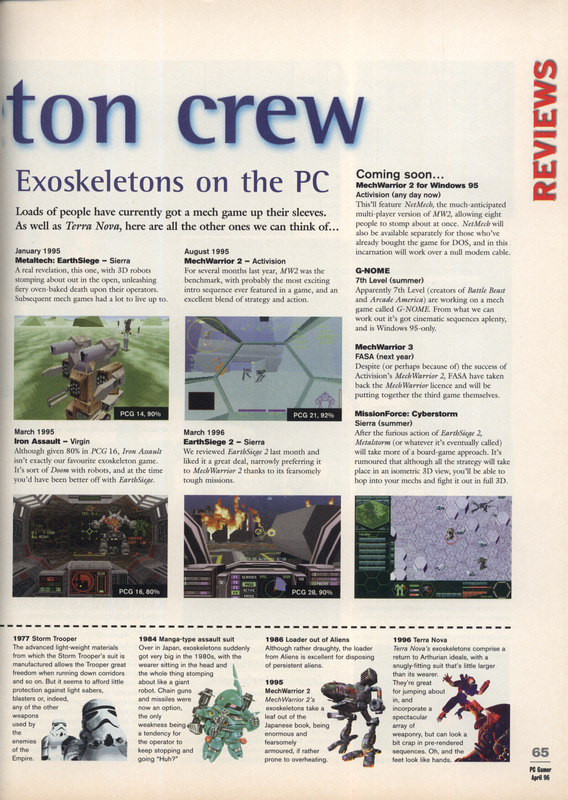 The story is largely throwaway and the missions only get going right at the end of the game. 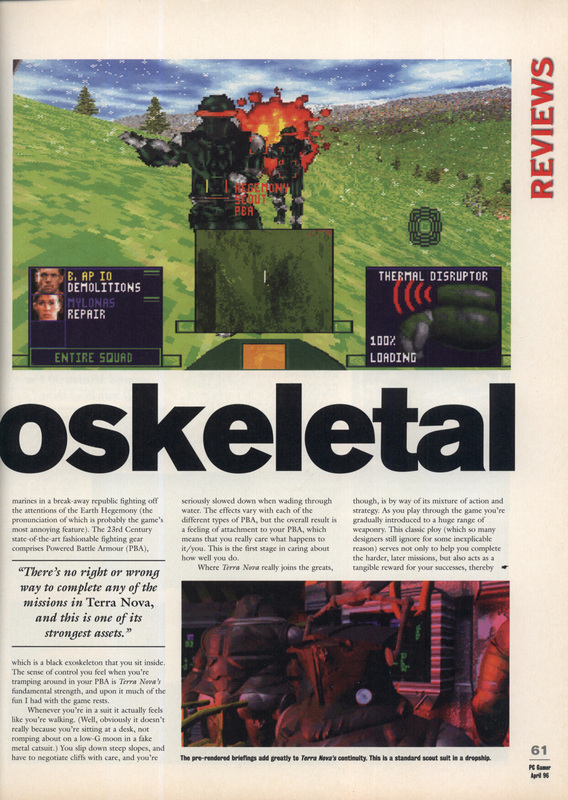 The engine and game mechanics are excellent though and it was a prime candidate for a mission pack if any game ever was. 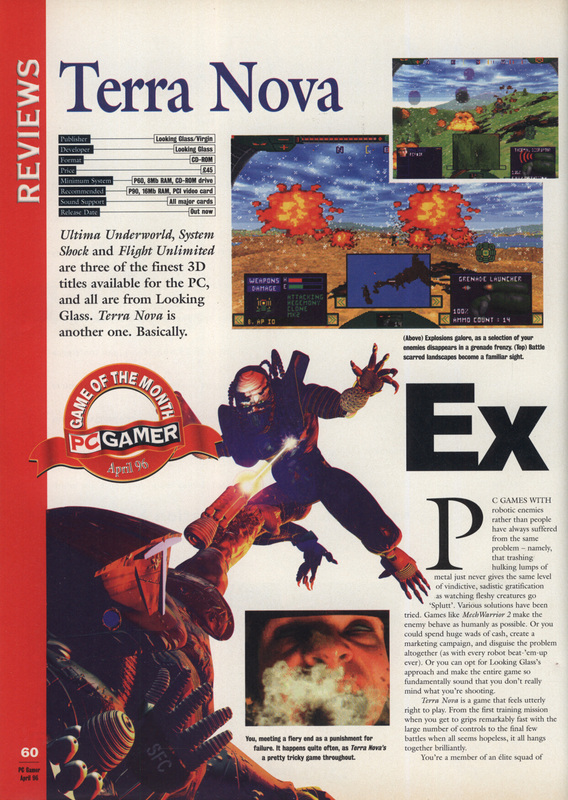 The game I really want to play on the VFX-1 is System Shock which will be the next candidate for a replay.